Articulating a well-thought out statement that speaks to your philosophy of teaching and learning is of tremendous value as a teacher candidate seeking employment and as a practicing teacher. School District’s value teachers who can articulate the philosophical underpinnings of their pedagogies. There are many ways, within a professional blog, that you might share this information. It could be a static page (such as this) as a way of introducing yourself to your audience. It might also be referenced in posts you make along the way. As you can see, I embedded a ‘pechakucha’ presentation that speaks to my passions for teaching and learning. (see instructions for embedding html code below). I have also uploaded a pdf file of my philosophy of teaching statement (using the ‘upload/insert’ tool) Philosophy of Educational Technology or, I can embed it in this text box by typing or copy/paste. In this case, I’ve uploaded a pdf file of a graphic organizer to highlight key aspects of my philosophy of ed tech but I could also easily link to a formal paper or reflection. Another option would be to create a slide show that illustrates my philosophy in a more dynamic way. The example above was created in Haiku Deck and uploaded to Slideshare. 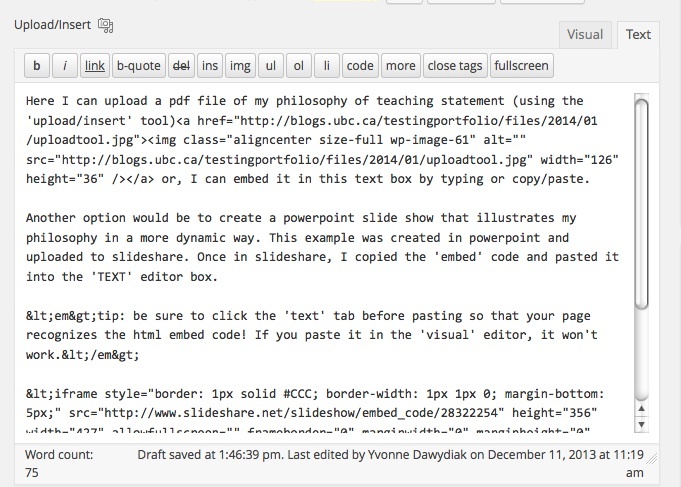 Once in Slideshare, I copied the ’embed’ code and pasted it into the ‘TEXT’ editor box. This is also how you embed video from Youtube, Teacher tube or other video hosting sites. tip: be sure to click the ‘text’ tab on the top right of your ‘editing box’ before pasting so that your page recognizes the html embed code! If you paste it in the ‘visual’ editor, it won’t work.